Frank Dillon was the youngest son of John Dillon. His father was the owner of the firm Morrison, Dillon & Co., silk mercers in London. He was the owner of watercolor drawings. These were sold by auction in 1869. Frank was a landscape painter. He got his education at Bruce Castle School at Tottenham. Later he was in the schools of Royal Academy at the age of 22. He became the pupil of James Holland, a watercolor painter. He started painting in oil colors. From 1850 he started exhibiting at the Royal Academy up to 1903. He made a major achievement for over 50 years. He spent many years in Egypt. He also traveled extensively to places like Japan, Spain, Italy and parts of Europe. This influenced his style. A series of painting in watercolor that illustrated the customs manners and scenes of Japan were exhibited in London in 1877. In 1878, his work “Courtyard of the House of the Sheikh Said at Cairo” was exhibited at the Paris exhibition. Oriental art is used with the term eastern or Asian art. It refers to the historic and contemporary art originating from various cultures and reflects the society in which it was produced. 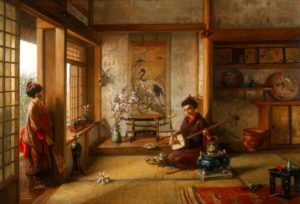 Among the artist of Oriental scenery, no one could distinguish themselves more than Frank. “The Tombs of the Menilook Sultans of Egypt”, by Frank was exhibited at Royal Academy in 1873. This has been repeatedly painted by many. In the Art Journal, it’s been said that though many have done this painting the effect given by Frank is exclusive. In 1850, he sent a view “On the Tagus, Lisbon” to the Royal Academy. He exhibited regularly until 1907. He was also a regular contributor to British Institution until it closed in 1867. Frank was one of the original members of Dudley Gallery. This closed in 1882. After that, he became a member of the Royal Institute of Painters in Water Colours. In 1850 he published a folio volume of “Sketches in the Island of Madeira”. He first visited Egypt in 1854. Most of his works are the outcome of this visit and his subsequent visits to Egypt. Some of his works on Egypt were “Rising of the Nile”, “The Nile Raft”, “Luxor, on the Nile”, “The Date Harvest, Egypt”, “The Pyramid from Giza”, “The Sphinx at Midnight”, “The Great Pyramid” etc. He studied the Arts of Japan and spent a year in Japan, 1876-77. He wrote an introduction to the catalog of the “Exhibition of Japanese and Chinese works of Art”. This was held at the Burlington Fine Arts Club in 1878. He took a lot of interest in the preservation of the Arab monuments at Cairo. He was active in the opposition of the destruction of Philae. Philae is an island in the Nile River, near Aswan, Upper Egypt. This place was submerged half the year in backwaters from Aswan Dam. He was sympathetic towards the liberal movement of 1848 in his early life. He was close to Mazzini. Mazzini was a revolutionary from Italy who fought for independence. He was sent on exile. Frank had a lifelong friendship with him. He was close to many leaders who were a part of the Hungarian Revolution. He assisted them when they were in exile. He remained unmarried. He continued painting until his death in 1909. Dillon died on 2 May 1909 at 13 Upper Phillimore Gardens, Kensington. Eleven of his paintings depicting interiors of houses of Cairo are in Victoria and Albert Museum.